... no Ghanaian travels on Ga, Twi, Ewe or Fanti passport Accra, Feb. 17, GNA- Mr James Amoah, a 61-year-old activist of the ruling New Patriotic Party (NPP), on Thursday criticised the tendency by a section of the public especially politicians to compromise national interests for ethnicity. "We should all be looking for what is good for Ghana and not subject everything especially appointments into public office to ethnic scrutiny. Mr Amoah, who lost the parliamentary contest of newly created Madina-Abokobi Constituency in Election 2004, told the Ghana News Agency in Accra on Thursday that it was not in the interest of the country's fledgling democracy to allow self-seeking and other parochial sentiments to undermine national integration.
" There is no Ghanaian who travels on Ga, Twi, Ewe or Fanti passports. 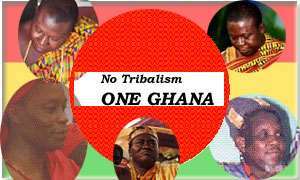 Every Ghanaian travels on Ghanaian passport so why should we divide our ranks?" he asked. Mr Amoah a founding member of NPP in Frankfurt, Germany and an Entrepreneur has declared his intention to serve as the maiden District Chief Executive for Madina Abokobi. He said although he was not a native from the Greater Accra Region he had encountered no obstacle in his bid. He said his only interest in the job was that he has the experience, resources and contacts, both at home and abroad to speed up the development of the District. Mr Amoah said he had served as a Councillor in the Frankfurt City Council "Where by dint of hard work managed to articulate and campaign against racism and sought the welfare of the black and ethnic minorities in Germany".
" I am the Chairman of the Unit Eight Landlord Association in Madina, I have a concrete product factory and transport business offering employment to the youth and other landed property in the area." He said he had showed interests in the development of the District by installing streetlights in a number of communities.
" My major priority is to tackle the water, sanitation and road problems in the area. I will restructure the Madina market, step up revenue generation, promote education and team up with the chiefs and people for accelerated development." Mr Amoah said he was liasing with the Ministry of Health and an international Non-Governmental Organisation to build a hospital at Madina.